This view is taken from the southern end of Lower Bridge Street, looking south. It is very close to an anonymous etching in P. Boughton, Picturesque Chester, 1997, no. 96. At the far left is the Bridgegate, with the Old Dee Bridge visible through the arch. Rising beyond the Bridgegate, to the right, are the Dee Mills (see Boughton, op. cit., no. 191), demolished in 1910. The tall half-timbered building is the Bear and Billet (see Boughton, op. cit., no. 167), with the lower Old Edgar (see Boughton, op. cit., no. 8) on the corner of Shipgate Street. In the distance is the spire of St Mary-without-the-Walls (see Boughton, op. cit., no. 194), built in 1885-7: the artist has moved it into the composition (the church actually stands high above the opposite bank of the river). The architectural details suggest that this watercolour was painted between 1887 and 1910. We are grateful to Peter Boughton of the Grosvenor Museum, Chester, for his help in preparing this catalogue entry. 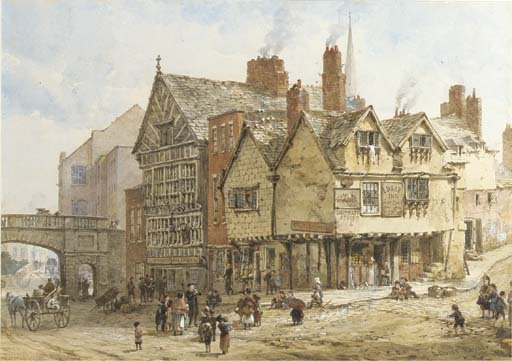 Another view of Chester by Louise Rayner was sold Christie's, London, 25 March 1994, lot 259, £20,125.